So I managed to get myself up for a third morning in a row to get my workout done. It was a cardio only day. I opted for Cardio Fusion. The last time I did this workout, it felt like a disaster. I struggled to keep my heart rate up. It was just painful. This time, however, I tried to focus on the moment. I stopped myself from thinking ahead to the rest of the day. I don't know if my focus was the cause, but it was a great workout. My hear rate was back up where it typically is for that workout. Time flew by too. No clock watching, not heart rate monitor checking, not thinking about how I needed to get done so I could start getting ready for work, etc. I had planned on abs as well, but was starting to run short on time (the only downfall of morning workouts is that I do have some place to be). Saturday I have plans of going to the track. It's an hour away, and I'll be meeting up with my mom for lunch before hand. So, I may end up having to get myself psyched up for another morning workout tomorrow and resting on Saturday. We'll see. I'm making no promises. I will say that I am enjoying the idea of being able to just leave work and be done for the day. That being said, I have yet to go home and just sit. Maybe that's just me period. Always gotta be doing something. But, it gives me the time to do that "something" like making a nut cheeze or preparing food for another day. Or, doing yoga if I so choose.Today I opted to get the ab work done that I had intended to do this morning. I chose Cathe Friedrich's Abs Circuit - Yoga-Based Abs. What do you do with "free" time? Is there really ever "free" time? Dinner tonight was super easy and virtually mess free. 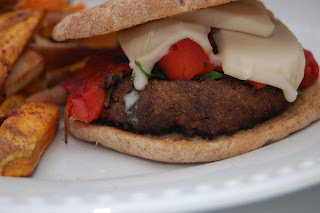 I pre-made Eggplant Patties last weekend and stuck them in the freezer for lazy nights like tonight. I topped them with a vegan mozzerella, roasted red bell peppers, and baby spinach with sweet potato "fries" on the side. Preheat oven to 375 degrees. Microwave eggplant until soft, approximately 5-6 minutes. Mix all ingredients except flour in a food processor until smooth. Transfer to bowl and stir in spelt flour. Spoon onto silpat sheet or parchment lined baking sheet and bake approximately 50-60 minutes flipping once. As a quick note, I had meant to add chickpeas or red beans to this mixture to create a firmer patty. I think that's why they took so long to cook up. These were really tasty and a spaghetti sauce would have been great as a topper as well. Congratulations on another morning work out. 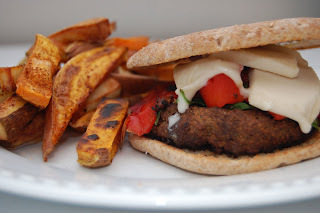 Your eggplant burgers look great. Even my hubby liked the look and sound of them and he isn't a huge fan of eggplant. Thanks for sharing. 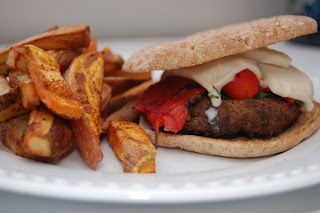 Mmmmm...I definitely need to make those eggplant patties! Have a great weekend, Heather! Those look yummy! First time stopping by your blog.......Like it! That's really interesting, I've never seen eggplant used this way. I do like the sound of it. What did you think of the vegan mozz? Those eggplant patties look great! Good for you for getting up early and getting your workout out of the way. I don't know why I haven't been able to do that lately. I hate to see with my free time I like to watch tv, or sometimes read a book. Kristen @ Swanky Dietician I'm not sure how long the morning thing will last, but I am enjoying not feeling pressure at the end of the day to do anything specific. If I want to watch tv or read, then I can, or I can cook or whatever. I'm a huge reader. It's how I unwind for sleep every night. Hi The Ordinary Vegetarian ! I love eggplant and this is such an easy, different way to use them. The vegan mozz....not horrible. It's much more like a fresh buffalo mozz - or this brand was anyway. Jessica @ eatdrinkbreathesweat now don't get all crazy with the morning workout fiend thing! LOL I've only managed this 4 days now! Things could easily change on me. Gonna keep trying though. Thanks so much for stopping by Fit and Forty Something ! Hope to see you back. Anna @ Newlywed, Newly Veg Let me know if you try them out. I'd love to hear how you like them or tweaked them. Hope you're having a great trip home! Alicia @ Vegan Epicurean Your hubby may like these. They don't have a super strong eggplant taste really. The Japanese eggplants tend to be a lot milder in my opinion as well.